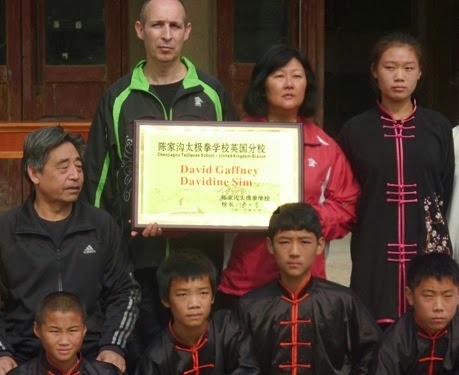 A few years ago we were training in Chenjiagou when one of our group posed the question "what is the most important element in determining whether a person would develop a meaningful level of skill"? The answer - "discipline and the capacity to work hard for an extended time". But is the willingness to "eat bitterness" enough? An old Taijiquan saying suggests that "Taijiquan can only be taught orally" - that is from person to person. The aforementioned "oral transmission" refers to a close, long-term interaction between teacher and student, and assumes that the teacher understands Taijiquan theory and is capable of and willing to impart it to another person and that the student has the intelligence and ability to understand the teaching as well as the diligence to put it into practice. So, simply training hard is not enough. We must understand and train in line with Taijiquan's principles and philosophy. If a person does not learn the correct method or take the correct path, it is difficult for them to advance to a higher level of skill. On reaching a certain level, it is not a question of time whether someone can further improve. The key is whether he has acquired the technical ability/skill to enable him to take his practice to a higher level. "It is remarkable to me how we can fill hours, days even, of television talking about basketball, and yet I always feel that we are failing to communicate the truth of the game. ...I worry that I am not up to the task of explaining the essence of basketball as it is played at the highest levels. I feel that it is like trying to explain music through words or to describe a painting through text. You can give a feeling of the work, or compare it to something else, but you can't re-create the actual feeling of being on the court, or making that move, of imposing your will, of the precise moment that you realise you can reach the front of the rim… Because it is not a moment, it is a sense, an instinct, a flicker of insight and nerve so sudden that you have to act on it before it is a thought. What do you see? A subtle shift of weight, a lowering of the hands, a leaning forward, a glance, and that is enough to set off a chain of events. They are actions that set off a thousand instincts. But from where we are sitting above the court, we are unable to explain the game through these small moments, and instead talk about the Bull's second chance scoring and the Rocket's bench production. I understand the need to do that...but I also know that we are simply describing a simulation of the game, rendering a three-dimensional activity into two dimensions". The parallel with Taijiquan is clear. Where the spectator or lower level player gets caught up in the obvious manifestation of a particular action, skilled exponents act from a deeper place. From a training foundation that considers every aspect of physical and mental harmonisation they reach a place where every "action sets off a thousand instincts". Chenjiagou street mural - "Everyone in Chenjiagou knows Jin Gang Dao Dui"